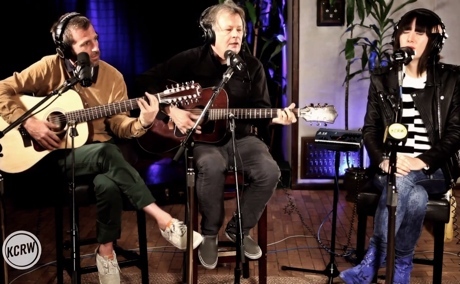 Yeah Yeah Yeahs frontwoman Karen O has already treated "The Moon Song" from the Her soundtrack to a solo rendition, a duet with Ezra Koenig and a live performance, and now she's given the song yet another reworking, this time with Her director Spike Jonze. This live in-studio session was filmed by KCRW. It finds Karen signing while accompanied by Spike Jonze on 12-string guitar and production designer KK Barrett on a six-string. The fellas mostly stick to their instruments, but they join the vocalist in singing the "million miles away" refrain. Karen O will perform "The Moon Song" at the Oscars on March 2.